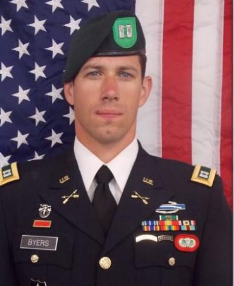 CPT Andrew Byers was killed in action in Kunduz, Afghanistan on November 3, 2016 while conducting a ‘train, advise, and assist’ mission with Afghan special operations forces. He died of wounds sustained during a mission against Taliban forces. Andrew Byers was assigned to the 10th Special Forces Group based at Fort Carson, Colorado. Byers, age 30, was from Rolesville, North Carolina. He joined the Army in May 2008. He had a previous deployment to Afghanistan and one to the Democratic Republic of Congo. A previous assignment was in Italy. His awards and decorations include the Bronze Star Medal, Purple Heart, three Army Commendation Medals, Army Achievement Medal, Afghanistan Campaign Medal with Campaign Star, Iraq Campaign Medal with Campaign Star, Global War on Terrorism Medal, Overseas Service Ribbon, Combat Infantryman Badge, Expert Infantryman Badge, Parachutist and Military Free Fall Parachutist badges, the Ranger tab, and the Special Forces tab. While attending Clarence High School he was a member of the high school swimming team, the student council, and sports editor of the yearbook. He graduated from High School in 2004. He later attended West Point – the U.S. Army military academy – where he graduated 12th in his class of 972. Once he joined Special Forces he was assigned to a High Altitude Low Opening (HALO) team. He leaves behind his wife – a graduate of the U.S. Naval Academy in Annapolis, Maryland. 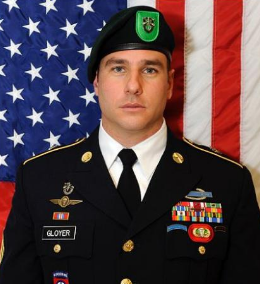 Also killed in the combat action was another member of the 10th Special Forces Group – SFC Ryan A. Gloyer. It is reported that four members of the Afghan SOF unit also were killed. Several Afghan SOF members were wounded. Kunduz has been the scene of heavy fighting over the past few weeks after an attack by the Taliban in October. The city of Kunduz was seized in the fall of 2015 by the Taliban for over two weeks. 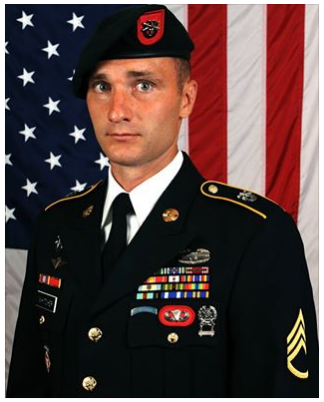 “Army captain from Rolesville killed in Afghanistan”, The News & Observer, November 4, 2016. “Special Forces captain from Clarence killed in Afghanistan”, The Buffalo News, November 4, 2016.